After our two-night Gully Lake Misadventure in 2015, this was supposed to be our first “real” winter trip. The plan was snowshoes and a sled for each person, and we chose to reserve cabins to give ourselves a break from the frigid Maine nights. 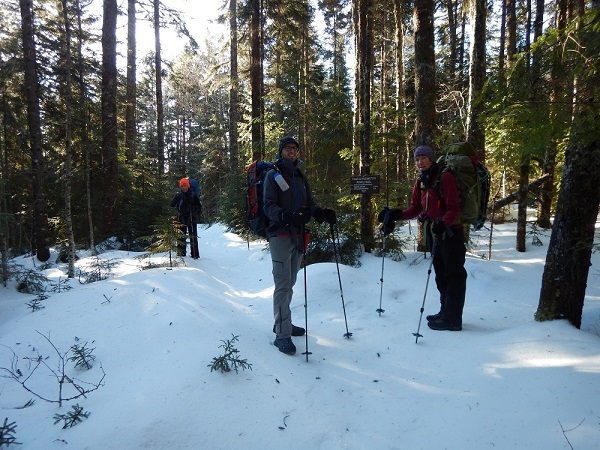 Since this would be our first winter trip in Baxter State Park, we planned to stay below tree line and explore the southwest part of the park, which was mostly new to us. We’d hike in from the winter access point near Abol Bridge and spend four days exploring the area around Kidney Pond and Daicey Pond. The only summit we were planning to attempt was Sentinel Mountain, which only just reaches the tree line and is not considered to be an area of avalanche risk. Winter in Baxter is whole different game and the park has some great resources, including a full Winter Camping Handbook to help with planning. We had been experiencing an unusually warm and relatively snow-free winter in Nova Scotia, but we had high hopes for the trip. Unfortunately, even northern Maine couldn’t provide us with much winter this year. Wade had been watching the forecast closely and it wasn’t looking good. As early as a month out, it seemed clear there wasn’t going to be enough snow for sleds. Park Ranger reports (which they publish regularly year round on their Facebook Page) showed the Park Tote road had remained bare in places throughout the season. Early March conditions this year were described as being more like typical early to mid-April conditions. And on the day we were set to depart, Chimney Pond had seen only about half the snowfall that it had received by this date the previous year. The forecast was unchanged for the week or so leading up to the trip, predicting daytime highs right around freezing, with the coldest overnight low of -12C. Hardly the true winter experience we were looking for. We left the sleds at home and even some of our coldest weather gear seemed excessive, though we headed for Maine with a few different options for last-minute adjustments. 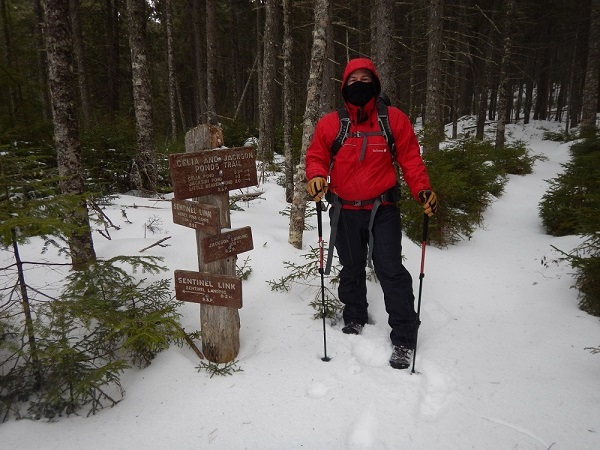 We planned to arrive in Millinocket one day early to stop by the Baxter State Park Headquarters to discuss the most up to date conditions along our intended route. When we planned out the route we had assumed that any small-medium water crossings would be well frozen, but this year that remained questionable. We wanted to make sure there weren’t going to be any unexpected obstacles along the way. Leaving ourselves the extra time and bringing along a few different gear options turned out to be a good idea. Almost immediately after we left Halifax, the forecast made a sudden and dramatic change. Sleds were still out of the question, but daytime and night time temperatures dropped significantly, and there was the potential of up to 16″ of snow overnight on our second night. We’d definitely be bringing both trail crampons and snowshoes. We arrived in the parking lot right on schedule. It was a bright clear day and the views of Katahdin on the drive in were breathtaking. It was cold and crisp though, and we didn’t want to waste any time standing still. After the final gear adjustments, we strapped our snowshoes on our packs (little did we know this was going to become a very familiar position!) and headed across the road toward the park. It felt good to be back in the park and back on the AT, for a few steps at least. This is the place where AT hikers enter the park, so we took some time to look over the all park information before signing in and heading up the Blueberry Ledges trail. Walking was for the most part quite easy in boots, though the trail crampons were a definite asset in a few places like the icy windswept ledges. After the ledges, the trail entered the woods. It was easy to follow and we made fairly good time. About an hour into the hike we came across a sled which had been abandoned on the side of the trail, obviously by some over-zealous weekend warriors. In it was a full box of wine, most of a 30-pack of beer (frozen solid) and various other food and beverage items. Some of the cans looked like they had been shot with a BB gun. It was disappointing to see that mess in Baxter and we immediately thought that this was probably a group that entered the park without a reservation. Over the next few hundred feet we passed more of their abandoned garbage including another box of wine, another 30-pack of beer and various other items including one of the largest cans of tomatoes that we’ve ever seen. I’m surprised that none of us thought to take photos of the mess. After this point the trail remained clear of garbage, more like we’re used to seeing in the park. At the end of Blueberry Ledges trail we walked on the Park Tote road a short distance to the Grassy Pond trail. From there we followed around the north shore of Daicey Pond toward the Daicey Pond campground. We stopped there for a quick lunch and then headed for Kidney Pond campground via the Daicey Pond road / Park Tote road / Kidney Pond road. It felt like a full day. Little did we know that one last challenge was still to come. We were a bit taken aback by the cabin design when we first arrived – we had booked a 6-person cabin, but rather than a common area with bunks, the 6-person cabins at Kidney Pond are actually twin side-by-side (they share a central wall) 3-person cabins, each with a single room containing a small wood stove, table, chairs and three twin beds (1 bunk and 1 single). The floor space is small, and doesn’t really allow for socialization. There is also no door through the central wall, so you need to go outside and back in to visit the other half of your group. This was fine, just not what we were expecting, and it would have been nice to know the layout in advance. During this time we were making the most of the tiny floor space in the other half of the cabin which thankfully did not have the same smoke problem – with some creative manoeuvring the five of us were able to sit around a table, but it would have been quite difficult to gather as a group if there were 6 people with full winter gear. Despite our best efforts, after a few hours we were still not able to open the other stove door even a crack without setting off the smoke detector. At this point we decided to take our chances and half of us switched to the other identical cabin (with fingers crossed there would be no late arrivals!). Despite the late start we did eventually get the second cabin warmed up enough to sleep. This was one of those, “If we could do it over again…” kind of days. It was a relatively restless night where we took turns banking the fire (the cabin temperature would drop precipitously as soon as the logs started to burn down) and adding reinforcements to the front door. There was a biting wind coming directly off the frozen lake and despite our best efforts there was a nice little pile of snow inside the front door when we got up. Our plan was a short hike to Sentinel Mountain. There are supposed to be spectacular views from the short loop trail on the summit. It was close to freezing and still windy when we set out after breakfast. There was a hard crust on the snow so we once again carried our snowshoes on our backs. It was a fairly easy climb to the top, though we quickly overheated and started dropping layers. The challenge was to try to stay dry from inside and out. The mist intermittently grew heavier, though we avoided any frank rain. It quickly became clear as we climbed that there would be no views on this day. Despite this, we decided to walk the loop trail on top anyway in hopes of at least one quick glimpse of something. The trail was surprisingly hard to follow in the deep snow (waist high in places) and it took us quite a while to make it around the loop. Not so surprisingly, we didn’t take any photos of the view-less thick fog. Heading back down was a much faster process. Shortly after arriving back at the campground it began to clear. By mid-afternoon the sky was blue and Sentinel Mountain clearly visible over the trees. But we didn’t quite have the energy to climb back up. It was a relaxing afternoon. We gathered together to play cards and dice games in the evening and went to bed early after the fairly sleepless night before. This was the night the forecast had called for 12” of snow. The wind had died down and we were all curious to see what the morning would bring. Despite the forecast, the morning looked not unlike the evening before. 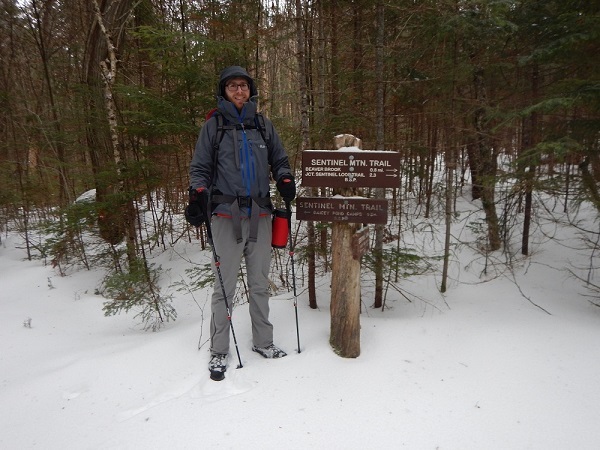 There was perhaps 2” of fresh snow – we’d keep on carrying those snowshoes! Today was supposed to be a short venture over to Daicey Pond campground and a bigger cabin where we were looking forward to a bit more space (we’d seen pictures of the inside of this one). We decided to take the “long way” back out to the main road via the Doubletop Mountain trail and the Slaughter Pond trail. The temperature had dropped significantly and the wind was again biting. This was the closest to real winter conditions that we would find on this trip. Coincidentally this was also the morning that 2 members of the group ended up with wet feet crossing a small brook. About ¾ of the way along the “long cut” we reached what the map suggested would be a small brook. On this day, however, it was a mostly frozen stream with a wide marshy approach. After looking up and downstream for a bit we all decided that it was too cold to risk getting any wetter in these conditions. This meant doubling back to the campground which no one was terribly happy about. Rather than retrace our steps completely, we set out though the woods following some old trail markers along what we now know was a portion of a long since closed trail. Luckily it was headed in the right direction, and did shorten the retreat somewhat. I think we all independently reached the same thought that we should stop back at the cabin to warm up / dry off and have lunch before setting out again. Luckily no other groups had arrived in the meantime, and in no time at all we had the fire roaring and spirits were good again. For our second departure of the day, we followed the Kidney Pond road back to the Tote road. The sky was crystal clear and the views were spectacular in most all directions! We decided that we’d split into 2 groups once we reached the Daicey Pond road. Two people took the direct route (hopefully to get a head start on the fire!) while the rest of us took the slightly more scenic route along Elbow Pond trail and around the south shore of Daicey Pond (we were secretly hoping that the cabin might have been occupied the night before with a bed of coals awaiting their arrival – no such luck as it turned out). The trails passed through lovely forest stands and the scenic views across the lakes were again beautiful in the sun. Even once we arrived in the campground, we were still blown away by the views. We arrived at the campground to find that the cabin layout was great but the woodstove was unfortunately again proving to be a challenge. Until the chimney was good and hot there was a fair amount of smoke but we welcomed any and all heat that would take the chill out of the air in the huge room. After a few hours the smoke subsided and we all started to warm up. Eventually Mark picked up one of the guest log books and started to browse. Very soon after, he started to smile…. chuckle… then laugh out loud. Soon he was recounting to us great stories of previous occupants’ misadventures, many with illustrations to further prove their points. And then we were all laughing out loud. Suffice it to say, if you ever have the chance, these books are not to be missed! This was an absolutely lovely day for a hike. It was again cool and crisp and the views were stunning from one vantage point to the next. This time we followed the Lost Pond trail to the Foss & Knowlton trail. 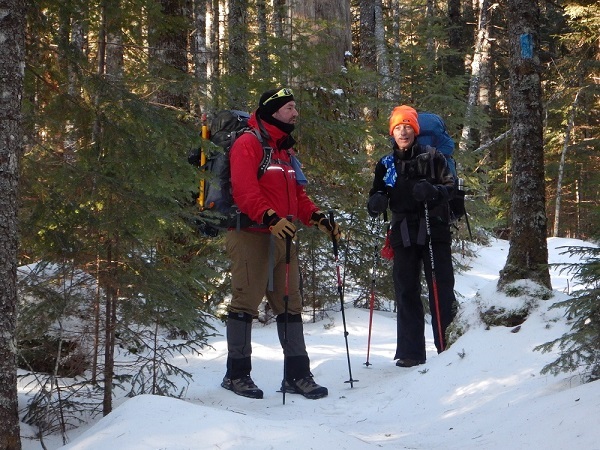 Note the position of the snowshoes, still tucked away on our packs. Over the course of the hike back to the car we could see the entire expanse Mt. O-J-I across the Klondike to almost 180 degrees of Katahdin’s glory. Though we have hiked in the park on sunny summer days, there has always been some degree of haze. Never before had we seen such crisp clear views of the peaks and valleys. It was a relatively easy walk back to the cars. It never came close to snowshoe conditions. Ahh well, the forecast was pretty clear, and it would have been irresponsible to leave them at home given the large amount of snow that was predicted. It definitely wasn’t the extreme winter trip that we had initially envisioned, but once again Baxter delivered. As always, we’ll be back… as often as the schedule allows. No question the high was the spectacular conditions for viewing Baxter’s southern peaks. The only low was the cabin / stove / smoke situation at Kidney Pond. We love this park as much as ever and we’ll be back again soon!